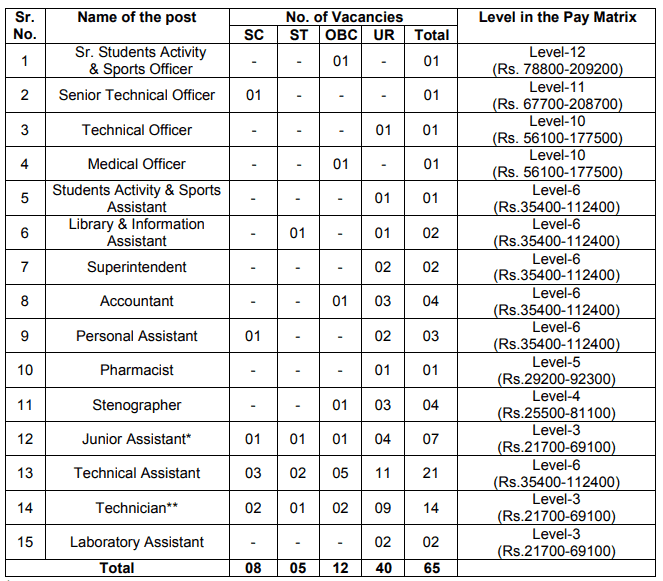 National Institute of Technology (NIT) Kurukshetra released a huge number of vacancies this year. An applicant who are interested in Latest Teaching Jobs, they have great opportunity to grab it. NIT has released notification to hire 65 non-teaching vacancies. Further, Candidates who are eligible and interested for these posts, they can apply for this recruitment through official website. Moreover, Candidate who wants to apply for National Institute of Technology Recruitment 2018 for Professor posts, they must apply before the 24th December 2018. Further details like important dates, eligibility criteria, application fee, how to apply, admit card etc is given below. Educational Qualification: Candidate who wants to apply for these posts, they must have done following qualifications. 10 point scale) and consistently excellent academic record. Technical Officer: B.E./B.Tech Degree in Electrical Engineering with first class or equivalent grade (6.5 in 10 point scale) and consistently excellent academic record. Medical Council Act, 1956 (102 of 1956) and must be registered in a State Medical Register or Indian Medical Register. Students Activity & Sports Assistant: First Class Bachelor’s Degree in Physical Education from recognized University or Institution. ii) Strong record of participation in college activities including arts (paints, photographs, drama, dance, music), event management, journalism etc. University/Institute and Bachelors Degree in Library Science. Accountant: First Class Bachelor’s Degree in Commerce with Honours in Accountancy / Finance or equivalent in grade from a recognized University or Institute. speed of 100 w.p.m. in Stenography. Pharmacist: 10+2 or equivalent in Science subjects from recognized Board or University. ii) 2 Years Diploma with First class and minimum 6 months internship in Pharmacy from an Institute recognized by the Pharmacy Council of India. Stenographer: Senior Secondary (10+2) from a recognized Board with minimum speed in short hand 80 w.p.m. in Stenography. w.p.m. and proficiency in Computer Word Processing and Spread Sheet. Technical Assistant: First class in B.E./B.Tech. in relevant subject or equivalent grade from a recognized University / Institute. OR First Class Diploma in Engineering in relevant field with excellent academic record. appropriate trade. Or Matric with at least 60% marks and ITI Certificate of 2 years duration in appropriate trade. Or Diploma in Engineering of three year’s duration in relevant field from a recognized Polytechnic/ Institute. Laboratory Assistant: B.Sc Degree in relevant field from a recognized University/Institute. How to apply for NIT Recruitment 2018 ? You can submit online application form at www.nitkkr.ac.in from 15.11.2018 to 14.12.2018 up to 05.30 PM. You also have to send a hard copy of the online application along with the self-attested photocopies of all the documents in support of the information given by you in your online application to the Registrar, National Institute of Kurukshetra-136119 (Haryana) by post. Kindly mention the name of the post you have applied on the envelope.